If there is a dish that symbolizes the cooking of Aleppo, this has to be it. Maria Gaspard Samra, a rare Syrian woman chef who gave cooking classes before the destruction of the city, grinds the cherries before cooking them, while my friends Lena Toutounji (famous for having one of the best tables in Aleppo) and May Mamarbachi (creator of the first boutique hotel in Damascus, Beit Mamlouka) both leave the cherries whole. May very kindly gave me cherries from her frozen stock so I could test the recipe. If you can’t find fresh or frozen sour cherries, use dried. 1. To make the meatballs: Mix the lamb, salt, and spice mixture (or allspice) and shape into small balls, the size of large marbles. Melt the butter in a large skillet over medium heat and sauté the meatballs until lightly browned. 2. 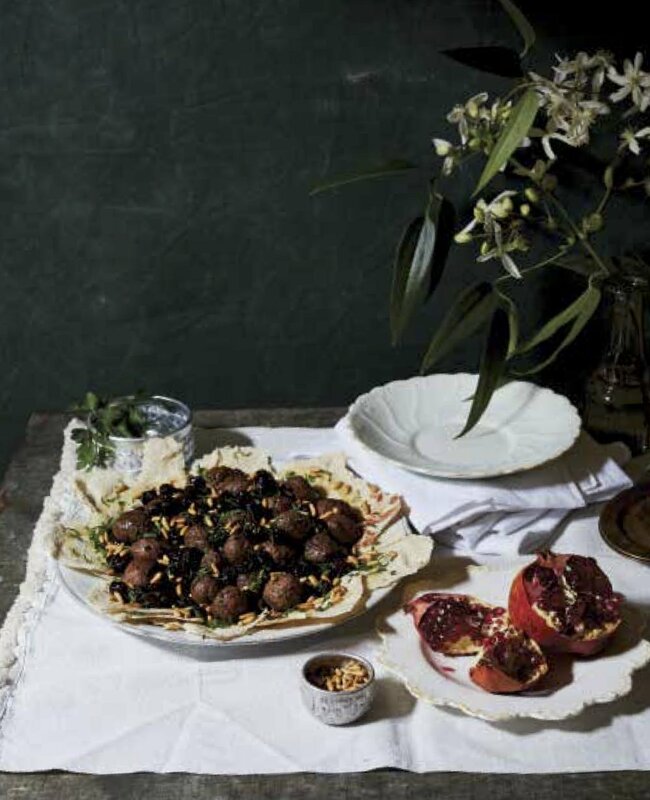 Put the cherries, sugar, and pomegranate molasses in a pot large enough to eventually hold the meatballs and bring to a bubble over medium heat. Reduce the heat to medium-low and simmer for 15 minutes, or until the sauce has thickened. Add the meatballs and simmer for another 15 minutes, until tender. 3. To assemble the dish: Arrange the pita bread triangles all over a serving platter, coarse side up, making sure the pointed ends are nicely arranged on the outside. Drizzle the melted butter all over the bread. Spoon the meat and sauce over the bread. Sprinkle the chopped parsley all over, then the toasted pine nuts. Serve immediately. NOTE: If you can’t find fresh sour cherries, use dried sour cherries and simply rehydrate them by soaking them overnight in water: 2 cups (500 ml) water for 14 ounces (400 g) pitted dried sour cherries. Add the soaking water along with the cherries when you make the sauce. Reprinted from Feast: Food of the Islamic World by Anissa Helou. Published by Ecco.